In the trade town of Scarport, buildings cling to canyon walls above canals of lava and provide shelter from the toxic volcanic atmosphere. Gaudy neon signs flicker as steam rises from the molten rivers running beneath the town. A trader walks along ledges carved from the volcanic rock, smoke swirling around her flowing cloak. Her robotic sentinels keep watch, but what dangers lie hidden in the shadows? 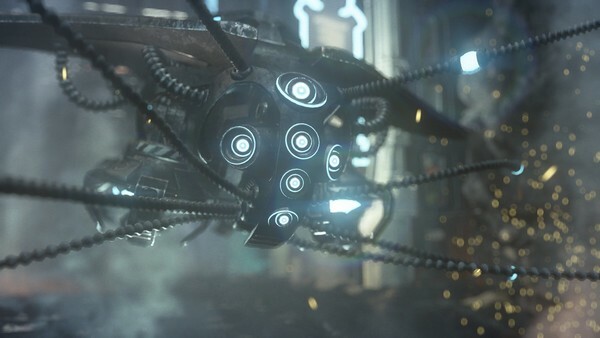 The 3DMark DirectX 11 tech demo brings this scene to life with intelligent tessellation and advanced volumetric lighting using real-time light scattering. The visible particles and clouds of smoke in the scene react to other objects using fluid dynamics simulation. Post processing, ambient occlusion and various lens effects complete the look.